At WhatShed we spend a whole lot of time looking at and reviewing wooden sheds of all different shapes and sizes. While some people may think that a shed is nothing more than just four wooden walls, we know that there is a lot more than that which goes into making a fantastic looking and long lasting shed. We have used our expertise and had some of the guys and gals in the lab coming up with all kinds of experiments in order to make the ultimate top 10 wooden shed retailers league table so you know who is going to offer you the best selection, best prices and the most hassle free experience when it comes to purchasing a wooden shed. 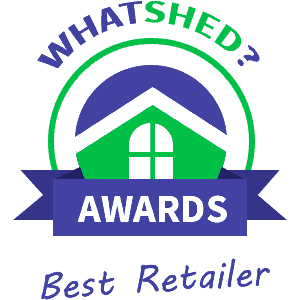 These are not just random web sites we have selected either, the ten wooden shed retailers that made our top ten list actually are responsible for around, 95 percent of wooden shed sales in the UK so you can rest assure that even the one in the number 10 spot is still a decent site. By checking out our, WhatShed top 10 wooden shed retailers league table, you are going to know exactly where you should be purchasing your shed from. which we really like and as most pages of their site have their phone number in large writing on the top of the page it is very easy to get in touch with them if you have any queries. As well as offering a great selection of sheds though, Shed Store is a site that is very easy to navigate and they offer easy to understand information as well. a message online if you have any queries. Gardens Direct so nearly took our number one spot, but the site can be a little bit busy in some places and many times when you are trying to look around the site a tab or another section can pop open, it is a small complaint we know, but it was this that kept it off the top spot. have no problems finding the contact information if you do need to ask someone a question. Most of their sheds do have some kind of extra or customisation option available. In all this is one very easy to use and straightforward kind of website. around the site to find them as not many sheds have extras listed close to them. All in all we really like the selection of sheds that Wickes offer and while it may not be as vast as some of the other sites, we feel for a person buying their first shed that a more well known company such as this may be a good place to start looking. to look through and it is laid out very well, but it does take a few clicks to get directly to the section that you want, which to be fair is a very small nit pick to have. Most of the extras that they offer are the same for all of the sheds and there is not much in the way of customisation on offer here. , you will love this. They offer a decent amount of customisation options as well as a few extras for each shed and they are very forthcoming with their contact info so getting hold of them should be easy. take more than a few clicks to get to the section you are looking for and they do also say that delivery can take up to 21 days. Aside from this though, we are actually impressed with B&Q when it comes to their selection of shed. Also many of the sheds that B&Q sell do include an installation service so that is a pretty big reason as to why they are above the ones below it. for something cheap and cheerful would go. As this is Homebase there is of course many extras that you can but, but surprisingly they do not list many with their sheds and you have to hunt around the site for them. any of their own sheds, they actually take your order and then have them shipped from another distributor which may lead to a long delivery time.